MUSCAT. On February 9, at Mater Dei Hospital, GEORGE (Tacsum Ltd), passed away peacefully at the age of 77, comforted by the rites of Holy Church. He leaves to mourn his great loss his wife Jane, his son Christopher and his partner Marites, his daughter Stephanie, his grandchildren Matthew and Ella, other relatives and friends. 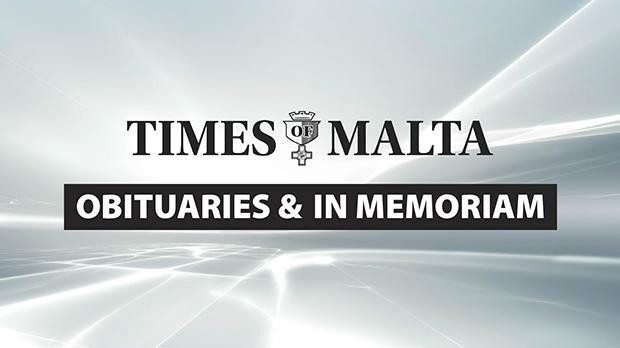 The funeral cortège leaves Mater Dei Hospital today, Monday, February 11, at 1.30pm for St Joseph parish church, Msida, where Mass præsente cadavere will be said at 2pm, followed by interment in the family grave. No flowers by request but donations to the Ursuline Sisters of Gwardamanġia will be greatly appreciated. BARTOLI – HAROLD. In loving memory of a dear father and grandfather, today, the ninth anniversary of his death. Dearly missed by his children David, Celia and Alan, their spouses and grandchildren. Lord, grant him eternal rest. BONNICI. In loving memory of JOHN, a beloved husband, father and grandfather, on the fifth anniversary of his demise. Beautiful memories silently kept of one we loved and will never forget. Deeply missed and always in our thoughts and prayers. Lina, Rosanne, Mark, David and their families. Lord, grant him eternal rest. BRUNO OLIVIER. In loving memory of FREDERICK, today the sixth anniversary of his demise. Fondly remembered by his wife Maud, daughter Graziella, his grandson Julien and granddaughter Kristina. Lord grant him eternal rest. BUTTIGIEG. In loving memory of our dear mother MARIA, née Vella, wife of the late Anton of Qala, Gozo, on the 22nd anniversary of her passing away. Always in our thoughts and prayers. Her family. CORDINA – ANTIDA. Re-membering a most loving mother and grandmother on her fifth anniversary. Never forgotten and forever loved by her children and their families. DEPASQUALE. Treasured memo-ries of our dear father SAMUEL on the 29th anniversary of his passing away. Always in our thoughts and prayers. His sons Franco, Henry and Tonio, daughters-in-law, grandchildren and great-grandchildren. FORMOSA. In ever loving and cherished memory of our dearest brother MARK on the 44th anniversary of his passing away. His sister Victoria and brothers David and Stephen and their families. Lord, grant him eternal rest. GATT. In loving memory of JULIETTE on her first anniversary. Her brothers and sisters and their families. Lord, grant her eternal life. GATT. In loving memory of JULIETTE on the first anniversary of her demise. Sadly missed by her father-in-law Henry and her nieces Nicola and Katryna and their families. Lord, grant her eternal rest. TABONE. In loving memory of our dear father ANTON on the 47th anniversary of his demise. Always in our thoughts and prayers. His children Marisa, Anton, Marga and their families.